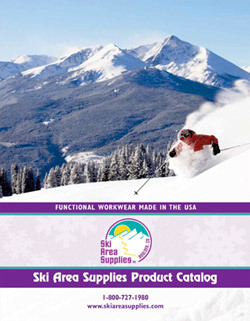 To request a catalog by phone, call Ski Area Supplies, Inc at 1-800-727-1980 between 9 a.m. and 6 p.m. MST and an SAS representative will take down your information and send you a catalog. If you call outside these hours, please leave your name, full address, product interest, and ski industry affiliation on our answering machine and we'll mail you a catalog within a few days. You can FAX your catalog request to 1-303-443-0258 24 hours a day. Be sure to include your name, full address, product interest, and ski industry affiliation and we will mail you a catalog. You can e-mail us at sales@skiareasupplies.com. In your message, please provide your name, full address, product interest, and ski industry affiliation and we will mail you a catalog.